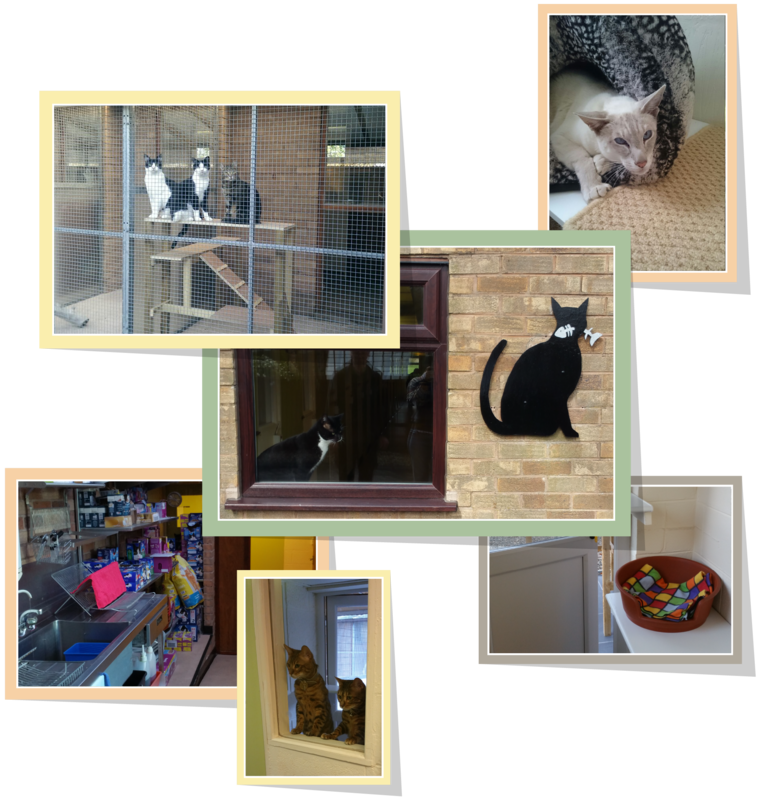 Following an extensive renovation project in 2017, the pens in our cattery each have a spacious bedroom with a large double-glazed window looking out onto the individual outside enclosure with bespoke climbing frames/seats. The bedrooms have 2 raised shelves allowing them to access different levels and sit and watch the world go by. The majority of our pens are south facing which means they have a lovely sunny vista (when the sun is out!). We can provide all the bedding and blankets or alternatively you are welcome to bring your own so that there is a familiar smell of home. We also provide ladders for our older guests to make sure they can make the most of the pens and the different levels. That said, if your cat is enjoying their twilight years then the pens can be set up so that everything is at floor level and the heating can be supplied 24/7 if required. All pens are heated in the colder months to ensure a toasty night’s sleep. We stock a wide range of food, both dry and wet, including Whiskas, Felix, Sheba, Hills, Royal Canin fit 32, James Wellbeloved, Arden Grange, Burns and Gourmet. We are keen that our guests should be able to eat the same food as they enjoy at home to help ensure no upset tummies. If your pet eats something a little unusual we will do our best to make sure we have it in stock for their stay (we cannot guarantee this). Unfortunately we cannot do this with prescription food and will require this to be brought with you. If your cat is on medication, then please do not worry, we will ensure the required tablets, injections or liquid are administered how you require at the times you require (as long as it isn’t midnight or the early hours!). The team are very dedicated and will make sure they spend time with all our guests to try and make sure they stay is as much home from home as we can. Please don't just take our word for it, come and see the cattery for yourself. Just pop in to reception during opening hours and ask a member of the team to show you around — no appointment necessary. A £3 deduction is applied for two or more cats from the same family sharing a pen. Cats must be fully inoculated and certificate needs to be shown before allowed into the cattery.